There’s something of a peloton feeling about riding a tandem. Two riders pedalling together in perfect harmony brings back summer memories of the big group of riders packing the roads in Le Tour. Many riders moving as one like a school of fish or a flock of birds. Being a part of Cycling Active has enabled me to try lots of activities I might never have had the chance to. Here I am fulfilling another cycling ambition (on a list of many): riding a beautiful tandem. What do you see when you look at a tandem on the move? Two friends on an adventure. A young naïve couple out on their first cycle tour. An old married couple who know that four legs are better than two. No matter who is riding, you always detect a sense of adventure. It’s not like ‘normal’ cycling — two legs, two wheels and two pedals. With tandeming, the numbers just don’t add up. It requires trust, selflessness, cooperation. Maybe it’s a more involved cycling experience because of these things. Or… maybe that young couple will never ride together again, the two friends never talk again, and the old couple, well, they were just a few spokes short of a wheelset. Whatever the truth is behind riding a tandem, I’m in for the ride and for the adventure, and I’m keen to find out which side of the fence I fall. Tandem riding should be on your cycling bucket list, for better or worse. 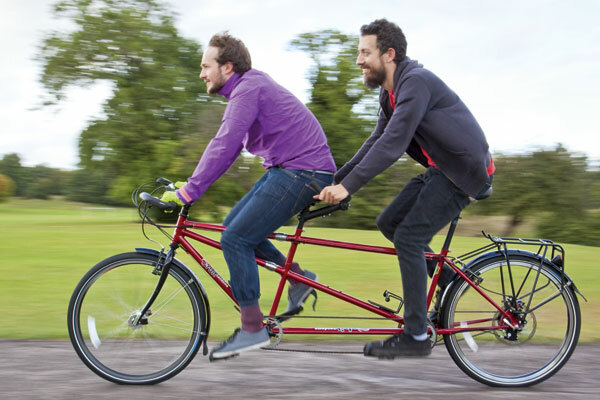 I don’t like to do things by halves, so when this opportunity to ride a tandem occurred, I was straight on the phone to Orbit Tandems – the master of two-seater bikes. It sent over its top-of-the-range model, the Orbit Summit Rohloff S&S. And what a model it is. The frame is hand-welded and sprayed by Bob Jackson on Orbit’s behalf. In its own words it is ‘probably the best custom frame builder in the UK’. And such boasts are trumpeted confidently when your work is as good as Orbit’s. It has used the best of British with the steel, Reynolds 631 steel for the main frame with a slightly finer Reynolds 725 for the rear stays. 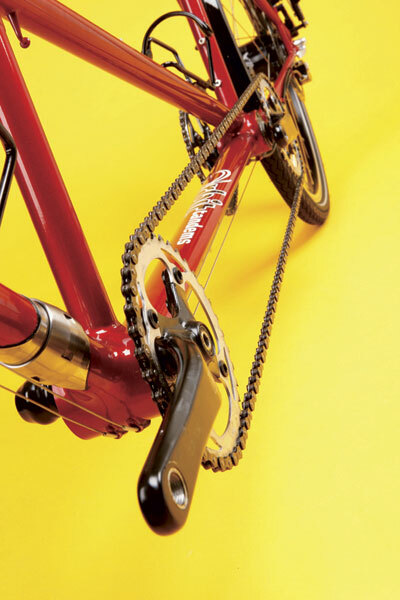 Bob Jackson has been building frames for over 75 years and this experience shows in the absolutely beautiful fillet brazing and delightful details like the intricate cable-guides. This bike has it all. Once you finally draw your eyes away from the amazing frame, you can let them wonder over the rest of the bike. One of the standout features here are the S&S couplers. They’re a simple system of attaching two steel tubes together. Why? So you can easily split the Summit in half and take it on your travels. Have you ever tried to fit a fully built tandem into the back of a Peugeot 206? It’s murder. The decoupling process is nothing new, but is slightly ingenious and devilishly simple. A simple tool unscrews the locking barrels, which holds all the important parts inside clean and safe. 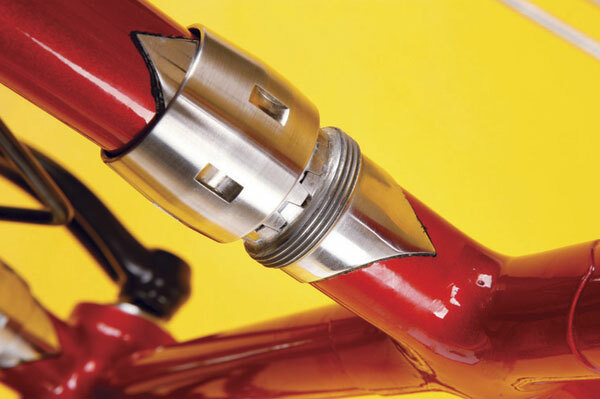 The gear and brake cables have their own little plastic connectors that perform a similar job and are even easier to unscrew. 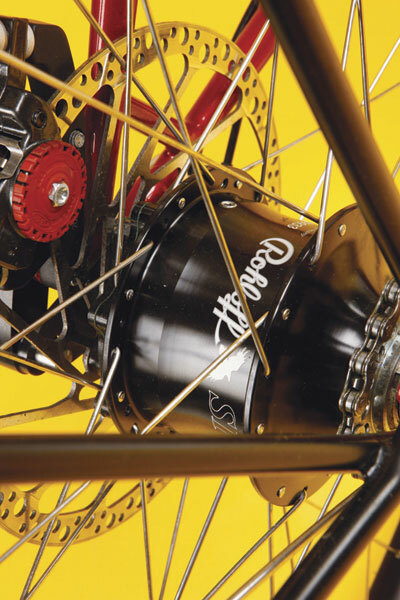 At the back of the bike, along with the famous Rohloff 14-speed hub and a handy parking brake, is a humongous 203mm disc brake. All together, the Summit is a hefty 22kg, and when that mass is moving at a reasonable speed, it takes some stopping – the reason Orbit chose such a large disc. Carrying two riders and possibly some luggage too, the weight burden is exceptional. With me and my riding partner aboard, we’re looking at about 150kg. Crikey! Luckily, the disc does the job it’s made to do, slowing the whole team down safely with discreet ease. The Summit range is built from the frame upwards, so it’s available as a frame only or with any specification you could want. Like cycle tourists, ‘Tandemers’ know what they want from their bikes, so when it comes to putting one of these beauties together, Orbit offers three sizes to chose from, plus a custom-size too. The latter option adds an extra £150 but doesn’t extend the three-month lead time. Watching two riders working together on a bike just makes me smile. I’m full of optimism about my first tandem experience. Orbit says the Summit has a cutting-edge design and geometry. Forgive me for taking its word for it, seeing as this is the first two-up bike my leg has ever been over; I wouldn’t know chalk from cheese in terms of tandem performance. I’m just here to enjoy the ride, and enjoy it I did. Don’t let the 22kg bike weight scare you. Split between two keen cyclists, it’s a very rideable machine. You’re moving only 11kg each, about the weight of a durable steel road bike, so it’s perfectly manageable. Finding the right partner is important. One of you controls the direction for two, and the other needs a very trusting heart. I learnt this the hard way when I let my good (but-not-the-best-cyclist) friend lead me on a short ride. Getting started was an intermittent and unsteady affair, something I experienced with each new person to take a seat with me. I didn’t trust him enough to lead me safely over a speed bump, let alone over hills and through valleys. In my defence, he didn’t have enough confidence or skill for one, let alone two riders. It’s like learning to ride a bike all over again each time you saddle up with someone new. Don’t let me scare you, though; once you’re moving, it’s the easiest thing in the world. Something like… riding a bike. It takes only a small amount of cycling competence to stay upright, and once you’re on for more than a few minutes, it becomes second nature. Perfecting your partnered riding style takes more time, though, but that’s part of the long-term joy of a tandem. If you’re tempted to tandem but don’t know which seat you’d prefer, I’ll leave you with a few things to consider: Who is taller? On a lot of tandems, the front section is designed to accommodate a taller rider. Same height? The responsibility of direction and control are in the leader’s hands, so think about whether you want that position of authority. Who is the most sneaky? You’ll get plenty of opportunities to rest and slack off if you’re sitting on the back, so it’s not all bad. But views are interrupted by a sweaty back, or worse, a bulky backpack. Who has the best eyesight? Spotting broken glass or other road obstacles and steering around them demands extra care. There’s certainly no opportunity of a quick bunny-hop to clear a pothole. So the best bike-handler should take the front. Is that you? Once you have decided who should assume which role, it’s really just a matter of practice: getting out there, learning to move in time with one another, divide the workload, communicate effectively — and agree on the best route… Much like in any relationship, really! Dominic Gill was a fan of tandems. So much so that he decided to ride one from the north of Alaska to the very south of Argentina. Why did he take a tandem? Well, for the adventures, of course. He gave a ride to anyone who was willing to help pedal in the direction he was going. With over 200 passengers along his two-year voyage, Dominic certainly has some stories to tell. He rides some highs and lows along the way, both physically and mentally. Sometimes loving the company, sometimes needing it, sometimes hating it. The funniest thing of all: he did it only because he knew — or hoped — it would make a good story. His ride was always intended to be written into a book, so luckily it turned out to be an interesting one. Orbit’s cheapest tandem comes in at £1,350, a lot more affordable for your average cycling couple than the Summit range. But if even those kind of prices are out of your budget, maybe Raleigh has the answer. At £600, Raleigh’s Adventurer tandem is one of the cheapest this side of eBay. Weighing in at 2kg less than the Summit Rohloff, and with two huge disc brakes, the Raleigh doesn’t look half bad on paper. The firm has kept the costs down with budget wheels, tyres, finishing kit and groupset, all of which hang from a relatively cheap Taiwanese frame. But at this price, it’s hard to ignore Raleigh’s particularly well-priced tandem idea.